Mechanical mods and rebuildable atomizers seem to be quite popular amongst a certain segment of vapors. I have to admit, I was a little slow in adopting the trend. After all, I remember mechanical devices in the early days and once variable voltage became affordable, they seemed less relevant. Of course now with high load batteries and low resistance RBAs, what once was old is now new again. The device I used to get back into the world of mechanicals was the Smok Magneto. Here’s the long-delayed review of this device. Disclosure: I received this item at no charge for review. This review features affiliate links. 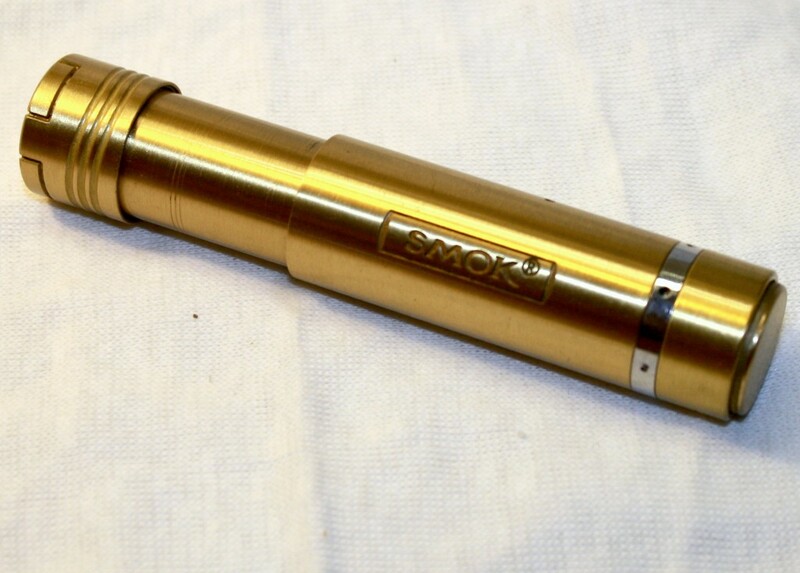 First things first: mechanical mods aren’t necessarily designed for beginners. Cloud chasing seems really cool, but having a basic understanding of battery safety and electronic theories like voltage, amperage and wattage are crucial. Misuse of these devices could end very badly. The Magneto clearly gets its name from the magnetic activation switch found at the bottom of the device. The concept is fairly simple, place two strong magnets with matching polarities facing one another so the normal position of the switch is to have the contacts apart. As a result, you get an incredibly smooth button action, that you just don’t find with a spring-loaded switch. The button is stiff enough to prevent accidental firing by placing the mod upright. A reverse-threaded collar surrounds the button to prevent accidental misfirings. It’s a little counterintuitive at first, loosening the collar to push it up and enable the button and the normal tightening twist to bring the collar down over the button. This does, of course, prevent you from accentually opening the switch assembly when all you’re trying to to is activate it. The bottom portion does unscrew to access the switch components. However, it’s not where the batteries go. Instead of removing the switch assembly to access the batteries, either the top cap, or the telescoping bottom cap can be unscrewed for access to the battery tube. The center telescopic tube allows the Magneto to accommodate a number of battery sizes. I tend to prefer the full-size 18650 mode as those batteries tend to be available with higher load ratings and amperage limits. There are a couple of versions of the Magneto floating around out there. 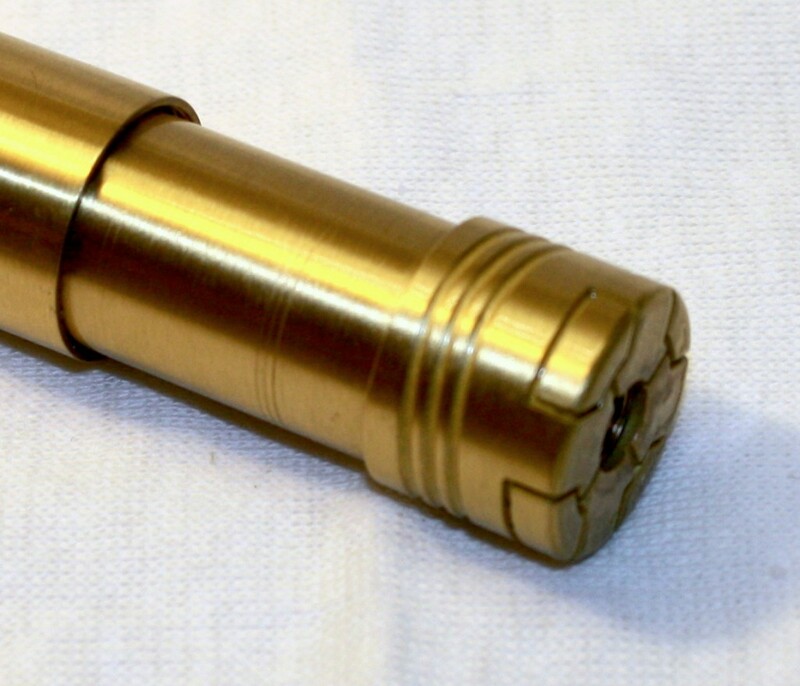 One version has an eGo-style connector and a floating center pin. I have the flat-top version in gold (which looks more like dull brass). There doesn’t seem to be a lot of point behind having an eGo-style tank on a mechanical device. I much prefer to use that style of tank on a variable voltage device, even if I’ve built my own coils for the tank. Using the Magneto has been fairly straight-forward and low maintenance. I often use a dripper (currently using the Kumiho A9 also available at VaporAlley) and that tends to be messy. Fortunately, the battery connector on the Magneto is completely sealed, so a Q-tip makes quick work of cleaning up overactive spills. I haven’t run into any real problems with the switch making a solid connection like I have with Smok’s ePipe. Generally, I found this to be a very easy and pleasant to use mod to use. It’s not as fancy as some others, but it’s simplicity and no-frills design are what makes me go back to this mod even though I have a few other mechanicals laying around. If you’re looking for your first mechanical, or just an inexpensive device that works and isn’t a clone of some far fancier device, it’s hard to go wrong with the Smok Magneto. PREVIOUS POST Previous post: Will FDA Regulations Increase Your Insurance Costs?